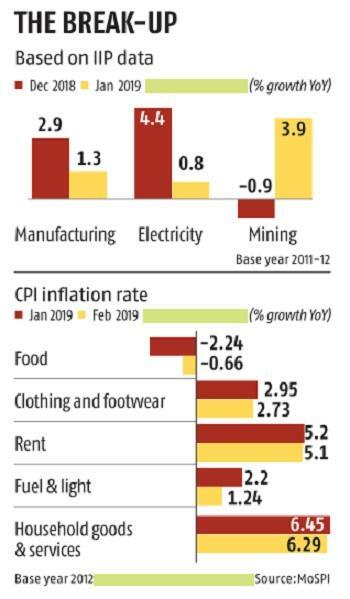 Industrial output growth slipped in January, while the retail price inflation rate rose to a four-month high, showed official data released on Tuesday. But, since the inflation rate remained below the average of the Reserve Bank of India's (RBI’s) target, economists said the central bank’s monetary policy committee (MPC) might cut the repo rate by 25 basis points in its April meeting to spur growth momentum in the economy. The index of industrial production (IIP) grew at a two-month low of 1.7 per cent in January, dragged by subdued manufacturing activities, compared to 2.6 per cent in December. The consumer price index (CPI)-based inflation rate increased to 2.57 per cent in February, primarily on the back of higher prices of non-food items, from 1.97 per cent in January and 4.44 per cent in February. In fact, the revised inflation number for January could have been an issue if the sub-2 per cent inflation rate persisted in February. The earlier number for January was 2.05 per cent. Prices of food items continued to fall. The food deflation came in at 0.66 per cent in February, compared with 2.24 per cent in the previous month. "With inflation remaining below RBI's target, inflationary expectations declining and growth profile weakening, RBI may front load its monetary easing in the beginning of 2019-20," said India Ratings Chief Economist Devendra Pant. CARE Ratings Chief Economist Madan Sabnavis said there was even chance of rate cut in the next policy as IIP growth and before that GDP growth have come in lower. This will make the MPC consider giving more impetus to growth. GDP grew at a six-quarter low of 6.6 per cent in the third quarter of 2018-19. "We expect another rate cut in the April meeting and subsequent action would be data dependent.” said B Prasanna, head, global markets group, ICICI Bank. Manufacturing, which accounts for almost three-fourths of IIP, grew at a mere 1.3 per cent in January, down from 3 per cent the previous month. “Lower growth in manufacturing was expected due to a high base effect and lower production, following higher stock built up in Q2 for Q3 where demand did not materialise fully amid lower rural demand,” Sabnavis said. 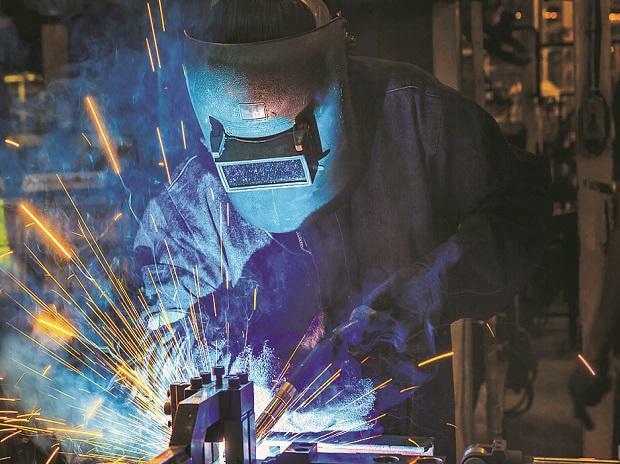 The capital goods segment, which connotes investment demand, contracted by 3.2 per cent in January, after growing by 4.9 per cent the month before, due to subdued growth in transport equipment and non-electrical machinery. Consumer durables and non-durables also showed subdued growth. The former expanded by 1.8 per cent in January, down from 3.9 per cent before, while the latter grew by 3.8 per cent, down from 5.9 per cent. “Growth in consumer goods — durable and non-durable — were lower as companies did not expand on their plans this month given the build-up of stocks,” said Sabnavis. Pant said even if the MPC cuts the rate, it is unlikely to spur investment demand in the economy with capacity utilisation still being low. “While election related expenditure may provide some support, probability of lacklustre IIP growth in coming months is high,” said Pant.